This is a quick and easy weeknight meal I made up a while back that was an instant hit with my hubby. Not that he ever complains about whatever I cook, but I love it when a new recipe creation receives a "That's really good, Darlin'!" This is one of those recipes. This one-dish meal packs a surprising amount of flavor for the small list of ingredients involved. Better yet, it's reasonably healthy. It doesn't have a traditional crust, so it's low carb, and it can easily be made gluten free simply by ensuring your chorizo doesn't have gluten hidden in it. I say "reasonably healthy", because the chorizo can be quite greasy. To make it even healthier, try substituting ground beef or shredded chicken for the chorizo--but if you do that, make sure to add in some taco seasoning to help make up for the lost flavor. While the chorizo is browning, cut the sweet potato into very thin slices. The thinner, the better here; they will cook faster that way. Arrange the slices in the bottom of a baking dish or pie pan. It's okay if they overlap some. Spread the cooked chorizo over the sweet potato crust. Layer the black beans over the chorizo. In a medium mixing bowl, combine all of the remaining ingredients: the eggs, cream, cumin, cheddar, and jalapeno. Pour the egg mixture over the layers in the baking dish. You'll see that it naturally separates into layers, with the egg and cream sinking down through the beans and chorizo, while the cheddar and jalapeno remain on the top. Bake for about 30 minutes, or until it is cooked through and the cheese is bubbly. Let stand for 5-10 minutes before serving. Dish up a piece and dig in! We like to eat it with a little salsa and sour cream, but it really is full of flavor on its own. I hope your family enjoys this recipe as much as mine has! It just might become a new weeknight favorite at your house, too! 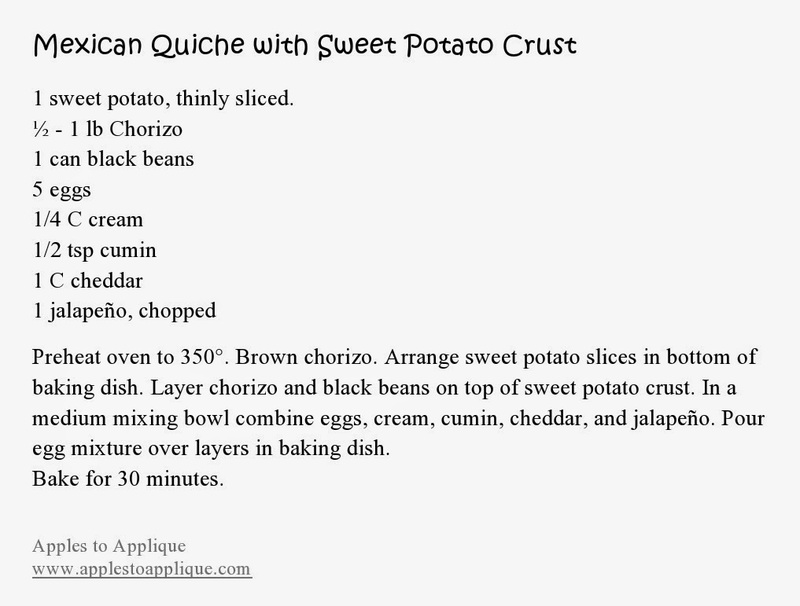 Right-click the image below to download a printable copy of the recipe. 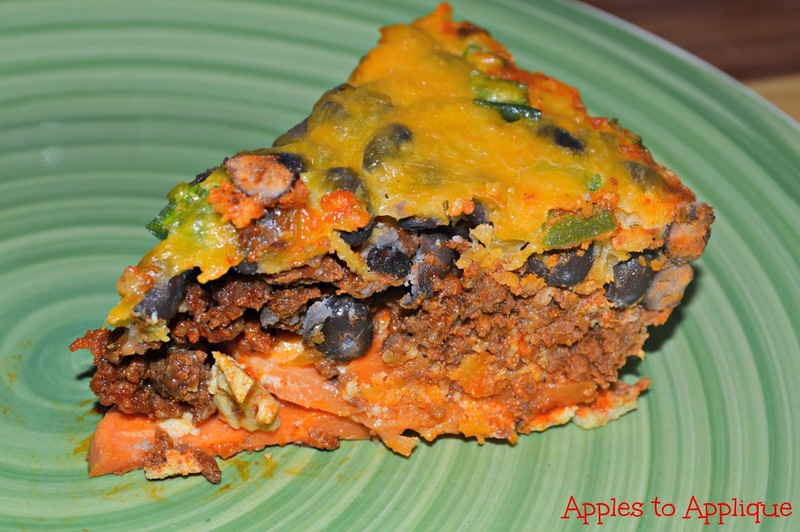 Linking up with Crafty Thursday Obsessions and Full Plate Thursday. In the mood for more quick Tex-Mex meals? 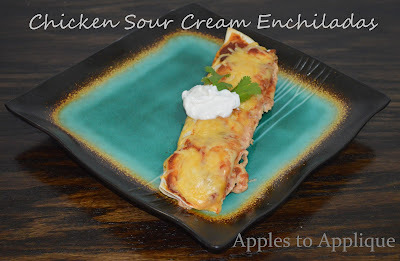 Why not try my fabulous 4-Ingredient Chicken Sour Cream Enchiladas? This looks so yummy and I have all of these ingredients on hand. Yea! I'll have to give it a try very soon. Thanks for sharing. That's actually how this recipe came about--I had those ingredients on hand and not much else! Sometimes those I-need-to-go-to-the-store meal creations turn out great. ;) I hope you like it! Thanks, Karen! I hope you enjoy! This looks really good. I would probably leave the meat out (only because I don't eat meat) and add more veggies but it really does look yummy. Will be trying soon. I don't eat much meat, either, and make vegetarian meals as often as I can without feeling bad for my husband. ;) I think this would make a fantastic vegetarian meal! If you go that route, I would definitely add more spices. The chorizo is full of flavor and spices, and I think this would be rather bland if you didn't add extra stuff to make up for it. Oh my gosh! This sounds so YUMMY. And chorizo! LOVE it!!!!!! Thanks for sharing! This is pinned and ready to go after I go shopping. Thanks Angela! We love chorizo, too! It is so full of flavor. I hope you like the recipe! 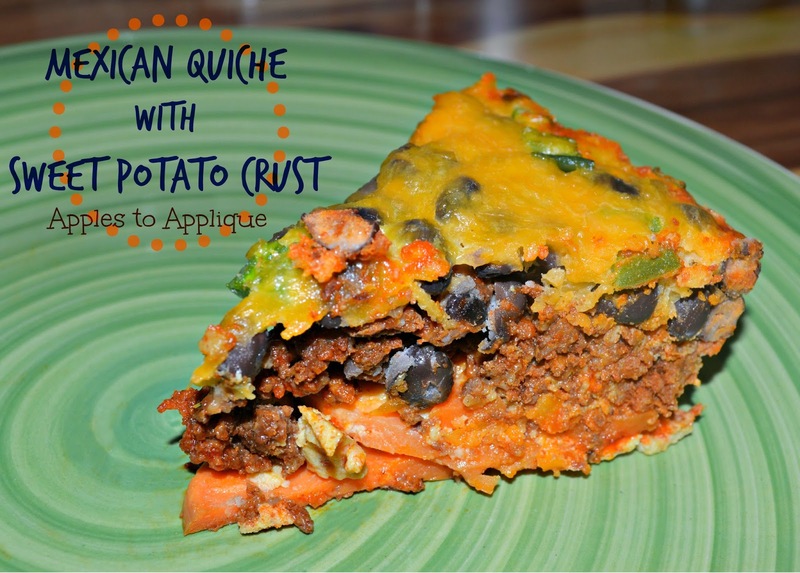 Your Mexican Quiche looks awesome and I love the sweet potato crust. Thank you so much for sharing with Full Plate Thursday and have a very special week. Thank you Miz Helen! The sweet potato tastes great with the chorizo, and certainly makes it healthier.